Cooling towers are heat rejection devices that, through a variety of methods, remove heat from fluid. 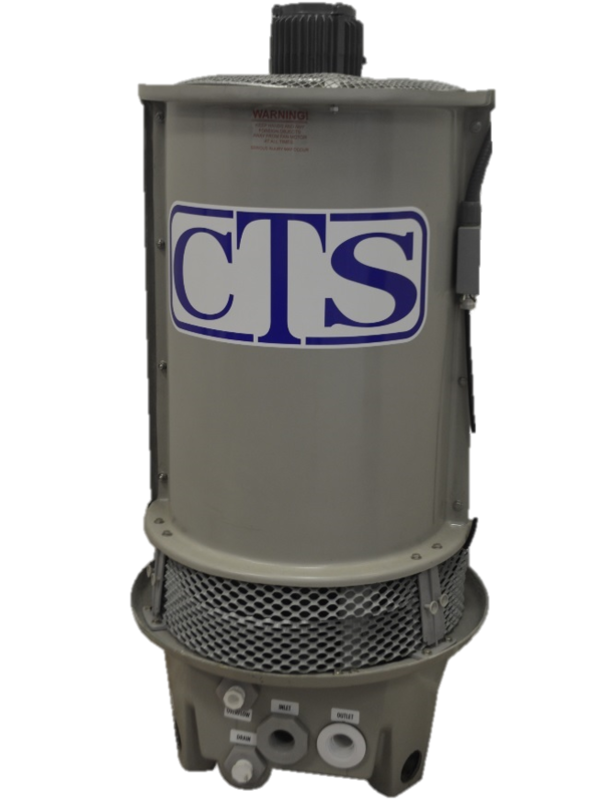 Chillers Cooling Towers – Cooling Tower Systems, Inc. Many instances combine the two processes, cooling towers to remove the heat altogether and chillers to maintain the chill, for optimal waste heat reduction. HVAC cooling towers are a common type of chiller cooling tower in more commercial settings such as large hospitals, schools and office buildings. These often utilize compact chillers which process between 1 to 40 tons of fluid, while central chillers are used in industrial settings as they can handle between 15 and 300 tons. Industrial cooling towers, however, are often much larger and designed to operate year round. These are commonly used to supplement the heat reduction already provided by industrial grade chillers. Automotive, nuclear power, plastics, dry cleaning, petroleum refining, electrical generation, food processing, construction, and refrigeration industries all utilize chiller cooling towers. In any application, fiberglass and stainless steel are most commonly used to manufacture the structure of the tower due to their strength and weather resistance. This is extremely important as towers are generally outdoors and elevated, making them susceptible to high winds and heavy weather. There are four main stages to all chillers, the evaporator, the vapor compressor, the condenser and the expansion mechanism. Cooling towers, when needed, are included at the condensation stage. At this point the fluid has been cooled through evaporation, but the temperature is still too great to return to circulation. A cooling tower allows for additional cooling of the condensed liquid, usually water. Through either mechanical or natural draft, the fluid is pulled into the tower where it is drawn through a fill pack. Located on the water collecting surface, this labyrinthine designed material increases the surface area that the liquid temporarily rests on as a cooled air stream passes over it, absorbing some of its heat and thereby chilling it. Once the substance reaches desired temperatures it is collected in a basin. In closed systems, pumps within the basin return the coolant to circulation. Cooling capacity, fluid discharge, compressor motor horsepower, reservoir capacity, tower placement, fluid type and volume should all be carefully considered when installing a chiller cooling tower. While thermostats often come standard in installation, optional emergency alarms to detect diminished cooling provide additional safety measures. Chillers Cooling Towers Chillers cooling towers are supplementary means of eliminating waste heat that is a byproduct of many processes that require the use of air and liquid chiller systems. Chillers are refrigeration systems that cycle constant streams of coolants in order to provide controlled cooling of products, mechanisms and factory machinery.